Sandy-affected downtowns, downtown property owners, and downtown businesses are experiencing great frustration in recovering and planning for a sustainable future. There is a myriad of issues, many in precedent-setting combinations. Downtown New Jersey is reaching out to all of its members and partners to join in collecting best practices and case studies for downtowns internationally that have experienced flooding and developed practical ways to mitigate such events in the future yet remain vibrant downtowns. While Downtown New Jersey had begun work on a guide for downtowns to improve their ability to provide key services to their communities as soon as possible after a disaster, an article in the Ocean City Gazette provided the best outline of the issues being faced in downtowns post-Sandy. We will continue to work on the guide, but also are inviting assistance in collecting the best practices and case studies from around the world. Somewhere, someone has already tried and succeeded in addressing each of the issues our downtowns are facing, singly or in combination. We are open to any source of information and initially will be collecting input without evaluating or filtering. We will then organize the information and determine the optimum way to make it available. To the best of my knowledge, there is no organization working on a comprehensive collection of post-Sandy-type best practices and case studies. If there is, we will be happy to partner with them. This is a no boxes, no silos, research effort. We intend to have at least some of this information available for our May 16 annual conference. If you have any best practices that address the bullet points below from the Ocean City Gazette article, please send them as either a pdf, particularly if a published document, or a Word document. Web links to pertinent information would also be welcomed. 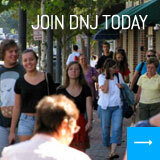 Please send any information that you would like to contribute to info@downtownnj.com. Thank you for assisting with this important undertaking.